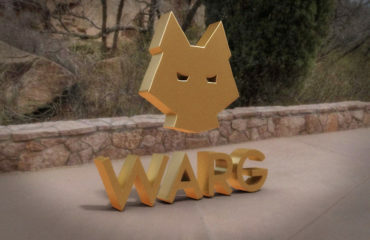 The WARG site only offer instructional material in electronic format. Ebooks and video downloads. But there are plenty of other places on the internet, where the works of Tom Stone can be found and obtained. The formats are electronic, hardcover and even some are marketed with props and all. Some can even be found on the pirate sites, unfortunately. If you happened to get hold of pirated instructions, and found any of the work useful, do consider getting the Self-publishing ebook and put a good number in the amount field! The field of conjuring is so small, that even a small amount of pirating cause real harm. Enough said about that. Let us review what is out there! The guys at Vanishing Inc have taken a good interest in the works of Tom Stone. 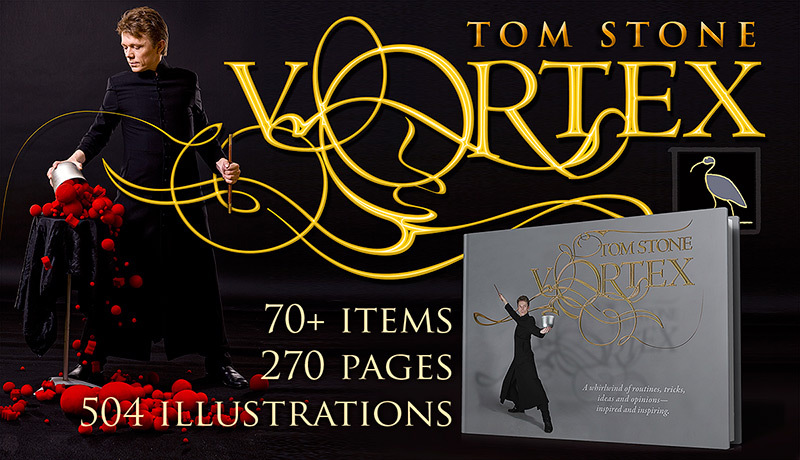 Here, you can find Tom’s two hardcover books Vortex and Maelstrom. 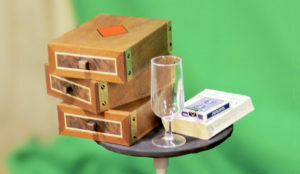 At Vanishing Inc you can also find material not found elsewhere, like a 50 minute lecture from the Session convention 2008 that features a indepth exploration of misdirection, illustrated with a simple coin routine, and also Mr Fogg – a Travellers routine that involves surprisingly little work. There’s also video down­loads of these routines: Silver & Sorcery, King Castling and The Annoying Four. Tom Stone’s collaboration with Card-Shark in Germany have resulted in the remarkable Factory Blanks deck. It is an utility device that can transform a simple card trick into a mindboggling display of mentalism. The included instruction sheet gives the basic details for three different routines, there are additional routines on the Card-Shark website, and Factory Blanks routines by Tom Stone and Jonathan Pendragon was published in the December 2016 issue of Genii magazine. In 2013, Tom Stone did a 2 hour long “Penguin Live lecture”, entitled Tom Stone LIVE. In the beginning, some small parts duplicates the 2008 lecture offered by Vanishing Inc, but then it veers off completely. Read the user reviews! During the same week as the Live event, two DVDs were produced. 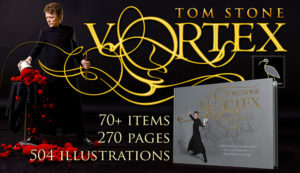 Vortex – Off the page that features six routines taken from the book Vortex, and Maelstrom – Off the page that features six routines from the book Maelstrom. With both DVDs, you have more than half of Tom Stone’s professional repertoire. 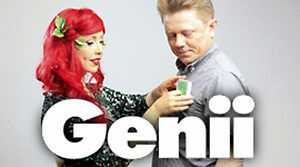 Tom Stone’s involvement with Genii magazine is not recent. In the 1990’s Tom contributed frequently, tempered by the editorial pen of Erica Larsen & Max Maven. And in 2009, Richard Kaufman made Tom into one of his regular columnist, and since then he have surprised readers with his ideas and baffled Kaufman with his disregard for deadlines. In these columns, Tom cast the net wide and far, from misdirection and cognitive science, to parlor routines, to electronics, to… the boundaries are few. Get a subscription and see for yourself. You will also get access to every single issue of Genii ever published, and soon all the back issues of MAGIC magazine as well. The electronic subscription is surprisingly affordable! 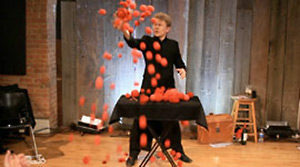 The danish magic store Pegani produced in 2006 a DVD titled Tom Stone – Caught on Tape, and there are still some copies available here and there. In the May 2014 issue of Genii, as an intellectual excersise, Tom published “Quantum Logic” – a pastiche on Jim Steinmeyer’s work. That is, an imitiation of the style and taste of another creator. But after putting it in print, Tom looked at it and thought “Damn, this is really good! I want to perform that myself!”, and commissioned Andreas Sebring at Metalwriting to build the props. 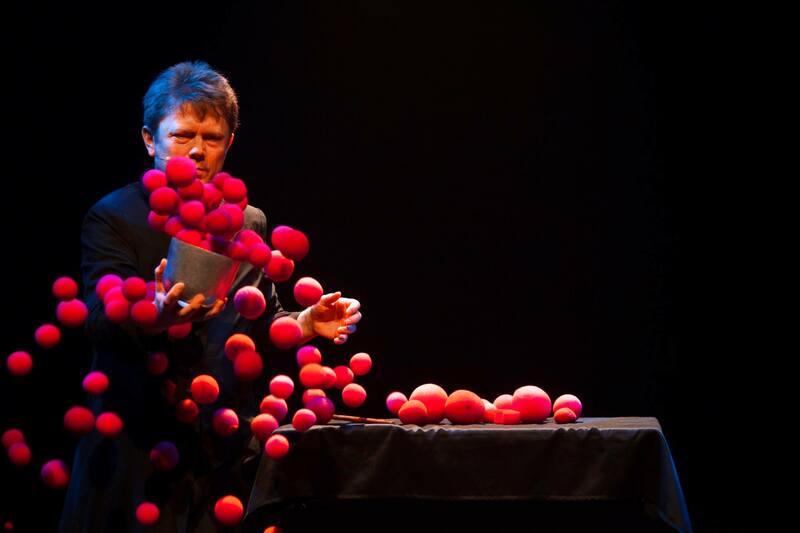 “Quantum Logic” is now the centre piece of Tom’s stage work. While you can’t find it on the Metalwriting homepage, Andreas makes a small number of sets annually, and you can contact him and ask to be placed on a waiting list.